Written by Andrew Dabb & Daniel Loflin Art and cover by Diego Olmos Photo Variant Cover Picking up several years after the hit RISING SON miniseries, the Winchester clan find themselves in the strangest situation imaginable - monster hunting in the Big Apple! 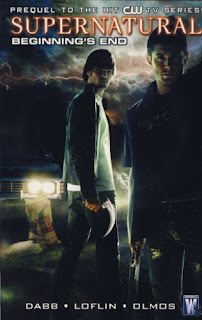 The definitive events that led to Sam leaving his family to attend Stanford, this gripping and horrifying story, courtesy of television series writers Andrew Dabb and Daniel Loflin, will explore the raw nerves of what makes the Winchesters unique and volatile. Fans of the cult hit TV series won't want to miss this pivotal 6-issue tale! I really like this TV show, so when I had the chance to borrow these comics, I was curious. This is a prequel of sorts to the events in the show. It was interesting to see the early development of the characters and the story. It was particularly helpful in explaining just how fragmented the family is by the time the first season started. There are things revealed during the show, but this actually shows them playing out. The family has obviously been through some very strange things and they all have their own way of coming to terms with things. I enjoyed these and look forward to more from the books and the show. 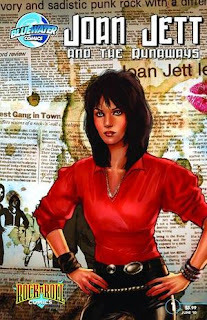 Joan Jett may be best known for her work with Joan Jett & the Blackhearts, including their hit cover 'I Love Rock N' Roll, but her career as a member of The Runaways This one shot tells about her life from when she helped to found The Runaways in the 1970s, the hardest rocking girls band, to when she broke off to her iconic solo career. Learn the true story of Joan Jett and The Runaways with this biography that's unauthorized and proud of it! I am not a huge Runaways fan, but I do respect what they accomplished in a mostly male world. When I borrowed some comics, this one was mixed in and I decided to give it a read. This is also why I read The Guild, which I really enjoyed, so I was hoping for a similar experience. I did like this, but I didn't entirely love it. If you like the band, it is worth checking out, but otherwise I am not sure if I would call it a must read. 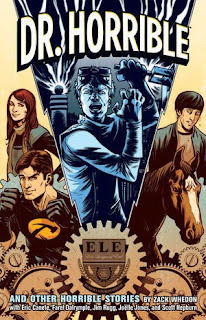 Based on the Emmy Award-winning web series Dr. Horrible's Sing-Along Blog, this collection of stories written by Zack Whedon (Deadwood, Fringe) chronicles some of the earliest adventures in the lives of archenemies Captain Hammer and Dr. Horrible. This anthology solves many unanswered questions left over from the show. For instance: What event inspired Dr. Horrible to become the world's greatest criminal mastermind? Why is Penny, the beautiful girl from the Laundromat, still single? How can you, the reader, be like blustering do-gooder Captain Hammer? And why is Horrible's sidekick, Moist, so . . . um . . . well, you'll find out! If you haven't had the chance to watch Dr. Horrible, DO SO NOW! I love it and I was so happy to read this comic book based on the web show. It was a lot of fun and I was so happy to revisit all of the characters and learn more about them. Just talking about it is making me excited. I might rewatch the show tonight! Following on the heels of THE NOBODY, his Vertigo graphic novel debut, writer/artist Jeff Lemire pens his very first ongoing series SWEET TOOTH. A cross between Bambi and Cormac McCarthy's The Road, SWEET TOOTH tells the story of Gus, a rare new breed of human/animal hybrid children, has been raised in isolation following an inexplicable pandemic that struck a decade earlier. Now, with the death of his father he's left to fend for himself . . . until he meets a hulking drifter named Jepperd who promises to help him. Jepperd and Gus set out on a post-apocalyptic journey into the devastated American landscape to find 'The Preserve' a refuge for hybrids. This unique and haunting new series is written and illustrated by Eisner-nominated creator Lemire (The Essex County Trilogy) and colored by fellow Eisner nominee Jose Villarubia. I was rather curious about this comic because of the attention his other comics, The Essex County Trilogy, gained a bunch of attention recently because of Canada Reads. I have also seen a couple reviews of this that made it sound interesting. And, it was pretty good, but I think I might be heading towards my 'get sick of graphic novels' period. Last year I hardly read any at all, so I was into them a bit lately, but now I am getting bored again. I think when I read book two, I will reread this one to give it another chance. Despite thinking I was a bit indifferent to it, though, I did like it. Don't think that I didn't. I just don't think I gave it a fair chance... It could be the idea, too. Post-apocalyptic-type books are very popular right now and I have read a bunch, so maybe I need something different for a while. Wasn't Joan Jett on Happy Days once? I actually am sporting the 'updated Joan Jett' hairstyle according to my salon. I should read the bio; I don't think I knew about her being a Runaway. Not sure I know anything about the Runaways for that matter. and Dr. Horrible? = hilarious! fun. And, yes, I love Dr. Horrible! These comic books sound like so much fun! I'm a huge Dr Horrible fan, so I must get my hands on that one. I wish my library got more graphic novels. We are so behind the curve, sigh.